Sabah (born Jeannette Gergi Fighali in Lebanon, 1927) is a world-renowned singer, movie star and stage actress. Her repertoire of songs is in the thousands,somewhere around 3,500; but I have also read that she has upwards of 4,500 (!) in her songbook. She is a polyglot, fluent in Lebanese, Arabic, Turkish and the Egyptian tongue, which is now Egyptian Arabic but has the shadings and history of the original Coptic language. Unfortunately, not enough of her movie and stage career has been released in any medium: you had to have been in the theatres and movie houses of the middle east to have seen her, although a few movies can be still be found if you peep around. Sabah’s musical output, however, is fairly well documented and she can be found on over fifty albums: plenty of CDs and 45s to be dug up; but to hear her on a 78 is rare. Her perfectly intonated, confidently sung phrases are such a thing of beauty, undulating and water like, as the Arabic scale is apt to be in the hands of a master. 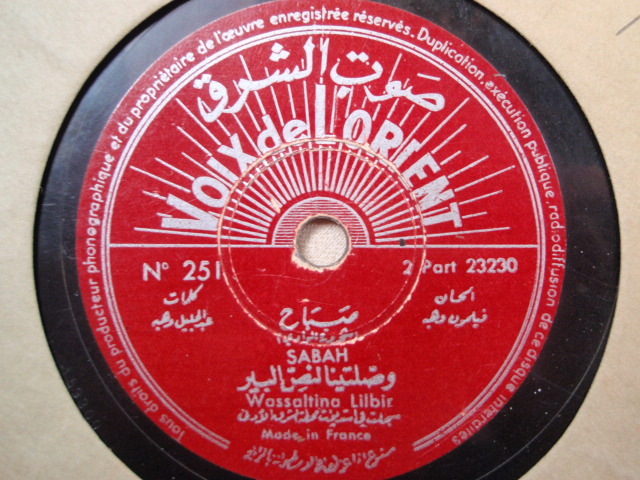 This song, Wassaltina Lilbir, is a two part-er, and a short epic, on the Voix de L’Orient label. It was recorded and manufactured in France sometime in the 1940’s. I have “glued” the two sides together with the agency of GarageBand, only the slightest tick happening at the beginning of what is the bridge(?) section. Sabah’s voice during this pivotal part of the song has to be one of my favorite female vocals of all time: her control, compassion and honesty shine, bringing the gravity back to the final swing through the main themes and ending.